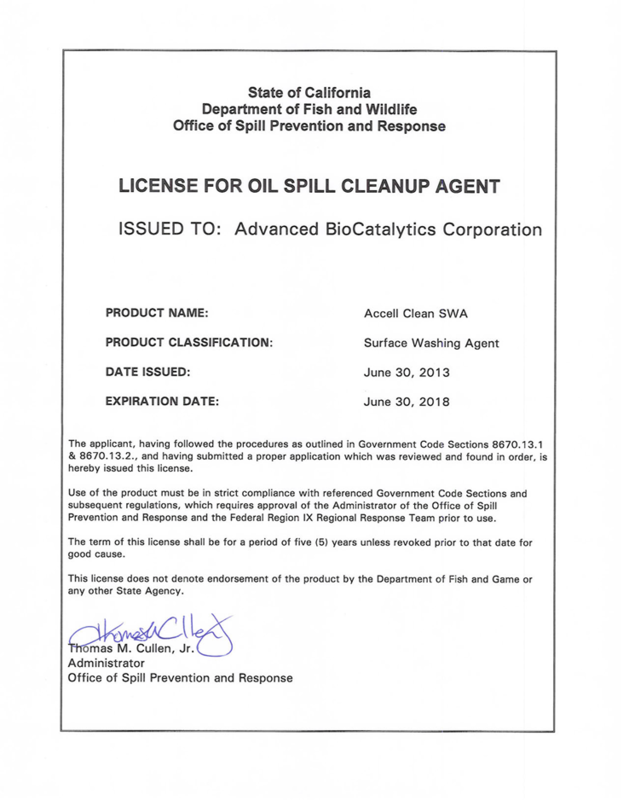 Accell Clean® Surface Washing Agent is a heavy-duty cleaning agent, which is listed on the U.S. EPA National Contingency Plan Product Schedule for Surface Washing Agents, designed for cleaning oil-contaminated surfaces, including contaminated shorelines, mangroves or sea grasses resulting from oil spills. Our product accelerates that natural bio-degradation of organic contaminants safely, rapidly, and in an environmentally friendly manner. Accell® Clean SWA incorporates a unique patented technology that amplifies the ability of surfactants to penetrate, lift, and clean contaminants from surfaces faster and more efficiently than other surfactants or traditional cleaners that depend on solvents and caustic chemicals to achieve their cleaning power. Accell® Clean SWA has applications in disaster related contamination such as structures, equipment, rail systems, streets, walls, floors, and sewer areas. 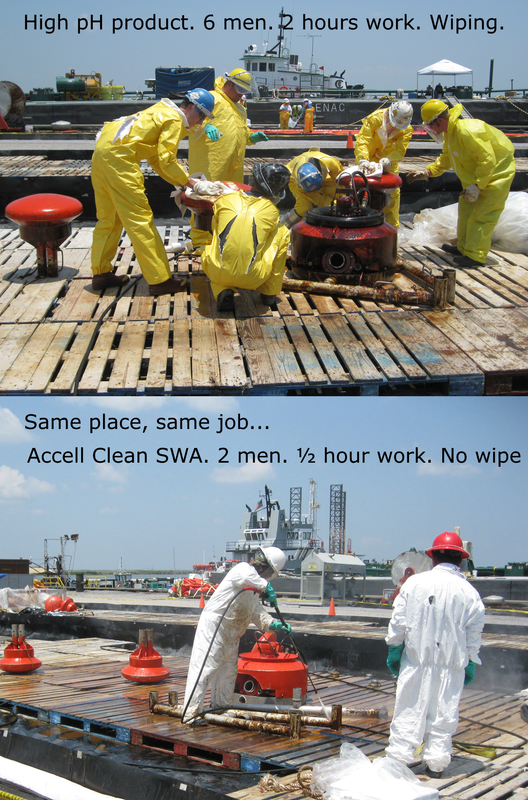 TIME SAVING: For the cleaning of ships, oil booms and other equipment involved in the clean-up process, the application of Accell SWA results in considerable savings in time and manpower, as experienced during the 2010 clean-up of the Gulf of Mexico oil spill, where Accell® Clean SWA was used extensively. Cleaning of HFO pumps dropped from 6 men cleaning in 150 minutes using a pH 12.8 cleaner to 2 men cleaning in 30 minutes using Accell’s pH 8.1 cleaner, with the same result. 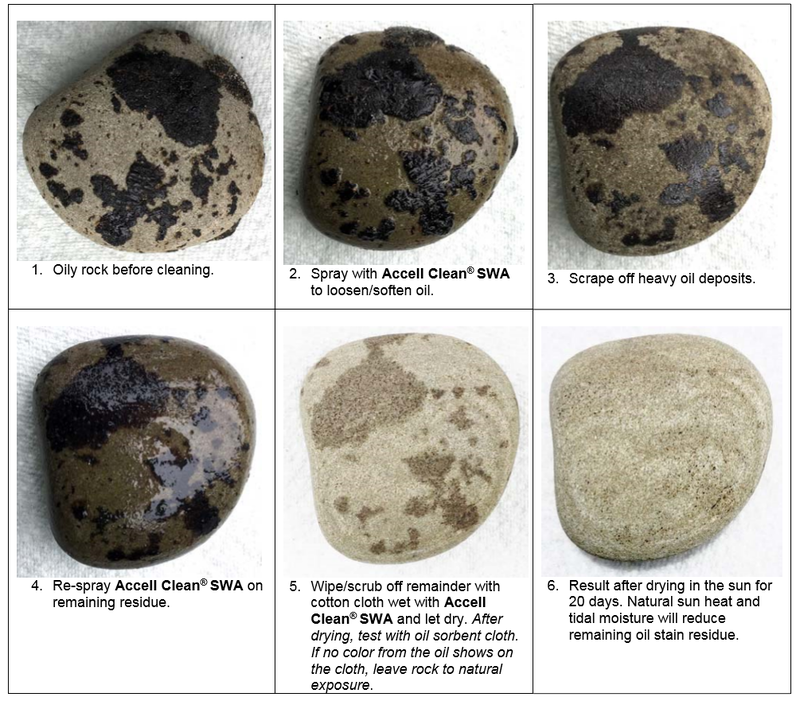 REMEDIATION: After cleaning, Accell® Clean SWA stimulates removal and bio-degradation of residual oils, hydrocarbons and organic contaminants in water, soil, or sand substrates. ODOR CONTROL: The Accell® Clean technology is utilized to eliminate grease, oil and biofilm in sewer systems and to control hydrogen sulfide (H2S) production. A two-year study in the Washington DC municipal sewer system has extensively demonstrated the ability of Accell® to control H2S in sewer lines by eliminating biofilm which is the source of the odor. 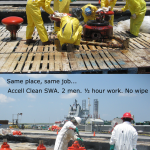 SAFETY: Because Accell® Clean SWA is pH neutral, the safety profile greatly reduces the potential for reportable chemical related injuries compared to the high pH products previously used for clean-ups. ENVIRONMENTALLY FRIENDLY: Accell® Clean SWA is safe for the environment and is readily biodegradable, is non-flammable, and does not contain, nor is it manufactured with ozone-depleting substances. 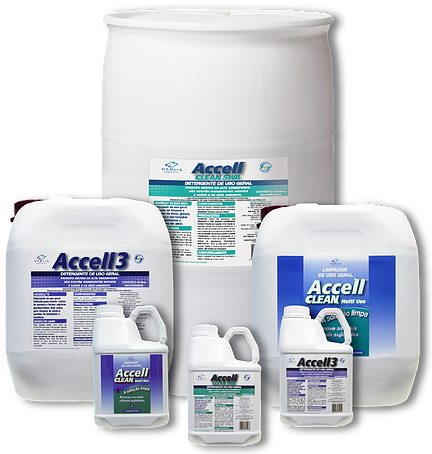 Accell® Clean SWA contains no heavy metals, cyanide, or chlorinated hydrocarbons. 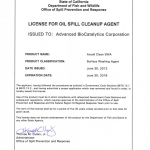 CERTIFICATION: Accell® Clean SWA is listed on the us EPA’s National Contingency Plan Product Schedule. FDA & USDA certified as containing only ingredients recognized as safe in food grade applications. US Coast Guard approved. 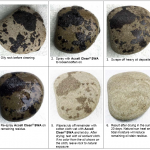 Recommended application rate is 1 liter per 4 m², dependent on amount of oil and the degree of weathering. Agitate sand with Accell Clean® SWA solution. The SWA will lift the oil from the sand due to its low interfacial tension. Collect the oil/product residue from the water’s surface using skimmers, absorbent pads, or other conventional means. Dispose of used clean up residue in accordance with local, state, and federal regulations. Dispose of clean sand as appropriate. Accell Clean® SWA solution can be recycled after centrifuge. Dilute 25% Accell Clean® SWA with 75% fresh or seawater. (For example: add 250 liters of Accell Clean® SWA to 750 liters of fresh or seawater for 1000 liters of mixed solution). Mix 150 ml of Accell Clean® SWA with 0.5 liter of water and flush down the head. Dilute 1 part Accell Clean® SWA with 10 parts fresh or seawater. Dilution rate depends on amount of kerosene or light oils. Ventilation: Use in well ventilated area. Skin and eye contact; protective clothing; treatment in case of contact: Protective clothing is recommended. Avoid eye contact. In case of eye contact, immediately flush with large amounts of water for at least 15 minutes. Get prompt medical attention. Avoid direct contact with skin and clothing. In case of skin contact, immediately flush with large amounts of water. Remove contaminated clothing, including shoes, after flushing has begun. If irritation persists, seek medical attention. For open systems were contact is likely, wear long sleeve shirt, chemical resistant gloves, and protective chemical goggles. Accell Clean® SWA has a shelf life of 1 year.